Content marketing is “in,” with good reason. Organized and productive, to develop enough content to stay in front of your intended audience. 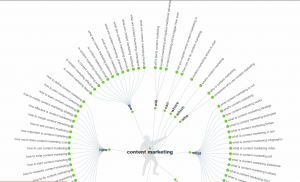 Fortunately, new content marketing tools appear almost every day. Here are some of my favorites for idea generation. I am only including free or low-cost tools. Many of these tools have paid versions with more features. 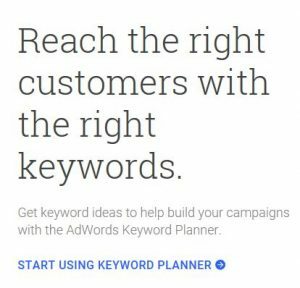 This tool enables you to discover the relative popularity of given topics based on keywords, in this case the words and phrases used for Google Adwords (not organic search data). For example, a quick search found that there are between 100,000 and one million searches each month for “content marketing” topics. (Yes, that’s a large range. However, even at the low end, the numbers are large enough to be of interest.) You can sort the results by the number of searches so you can quickly evaluate the most popular topics and get ideas for trending topics. For example, a search for “content marketing” (March 2018) revealed 411 keyword possibilities, some of which could be topics for articles. This data-visualization tool gives you detailed information on news, search trends, and trending stories. You can search by topic, and compare the popularity of topics for given timeframes and locations. For example, a comparison of “content marketing” and “public relations” revealed more interest in the latter in the United States over the previous 12 months. The upshot is that you can get an idea of which topics are becoming more popular, and key your content marketing to those topics. 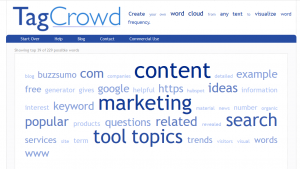 The site also gives you topics related to your search words. In addition to the questions outlined in the graph above, the tool matches the search term with various prepositions (e.g., “to” and “with”), compares the term using words such as “versus” and “like,” and provides related topics. 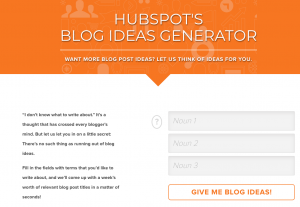 Enter a few nouns into HubSpot’s blog ideas generator and get five ideas for topics. Any of these could be good topics for articles. You can ask and answer questions on this popular site. This is a great example of effective crowdsourcing. One trick. Ask a question and then see what questions are related to your inquiry. This might prompt another great idea, since the related questions are often fairly detailed. I just learned about this tool, which gives you to visual representation of the frequency of words in your content. This can helpful for content marketing because carefully balanced word choice can improve search engine optimization (SEO). 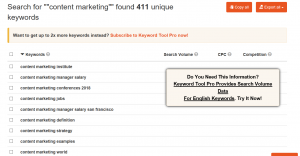 Simply copy and paste your content into this tool, set the number of keywords to two or three, and click “visualize” to see the word frequency. This is the “word cloud” for this article. This popular tool shows what content was most shared across all social networks and also which influencers are sharing it. 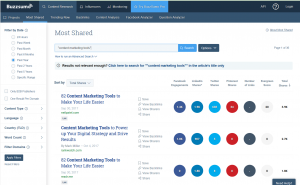 It might seem inappropriate to include BuzzSumo in a listing of free or low-cost content marketing tools, as the subscription fee is not for small budgets. However, this powerful tool efficiently identifies timely topics and, at least at the time I’m writing this, the company gives a short trial. That should be long enough for you to see if BuzzSumo is worth the investment for you. Learn more about content marketing and see examples of content marketing assets in other parts of this website. And sign up to be notified about new information about content marketing and related topics (bottom of the page).